The game that the director of Hellboy discussed last month will get an official announcement during Spike's Video Game Awards. 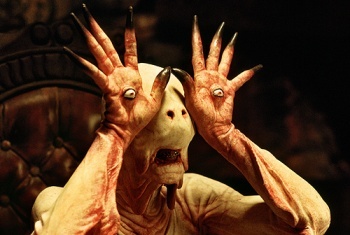 Guillermo del Toro is the director of both Hellboy films and the independent horror-fantasy flick, Pan's Labyrinth. Even though he was at one time connected to the Peter Jackson-produced Hobbit film, he mentioned back in September that he was in talks with THQ to make a videogame. He is an avid gamer; del Toro told a crowd at a book signing that he loves Valve's Left 4 Dead among other games. Having pitched many game concepts to various publishing companies back in 2006, it seems that del Toro will finally get his wish to make a AAA videogame. THQ's Core Games Executive Vice President Danny Bilson confirmed that Guillermo del Toro is in fact working on a game for THQ and that we'll get a full announcement next month during Spike's Video Game Awards. "You've heard rumors of us working with a big film director who is actually a big gamer," Bilson said during a speech at the IGDA Leadership Forum. "He's a gamer who wants to make a great game, and has very interesting points of view and is partnered very closely with myself and my writing partner, Paul," said Bilson, describing del Toro and Paul DeMeo, with whom Bilson has collaborated on The Rocketeer movie and many other projects. Bilson went on saying that THQ "will be announcing the game title and the studio and all of that on the VGA awards in about a month." I can't wait to get more information on this game, especially since del Toro hinted that it will incorporate some horror themes from the universe of H.P. Lovecraft. Call of Cthulu, the videogame? Sign me up.